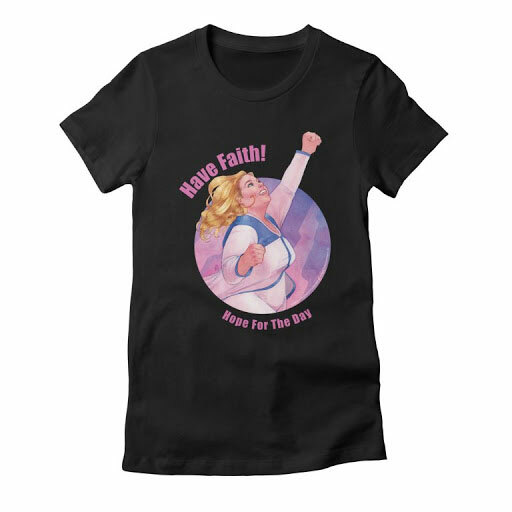 To mark the 68th annual Mental Health Awareness Month during the month of May, award-winning comic book publisher Valiant Entertainment and Threadless Artist Shops will offer a selection of limited-edition t-shirts featuring Faith, Valiant’s groundbreaking comic book character. All proceeds from the items sold will be donated to Hope for the Day, the mental health education and suicide prevention organization. Featuring the artwork of renowned Faith cover artist Kevin Wada and available only through May 31st, Valiant and Threadless’ first charity-focused collaboration features Valiant’s high-flying superhero. “Myself and many of us at Threadless and our community have family/friends who struggle with mental health issues. We are proud to support an organization working hard to help others deal with these issues and show they are not alone,” said Lance Curran, Artist Shops Account Director for Threadless. “It is an honor to work with so many talented people and friends from Threadless and Valiant on this project during Mental Health Awareness month. It is truly amazing to see the impact we can make and what we can accomplish as a community that refuses to stay silent about mental health,” said Jonny Boucher, Founder & CEO of Hope for the Day. Each year millions of Americans face the reality of living with a mental health condition. One in 5 Americans will be affected by a mental health condition in their lifetime and every American is affected or impacted through their friends and family. Take action today to help others as we fight stigma, provide support, educate the public and advocate for equal care. Throughout May, Hope for the Day and participants across the country are raising awareness for the importance of mental health. Each year we fight stigma, provide support, educate the public and advocate for equal care. Each year, the movement grows stronger. Created by former Marvel Editor-in-Chief Jim Shooter and Eisner Award-winning writer and artist David Lapham in Valiant’s acclaimed HARBINGER series in 1992, Faith has long been a central icon of Valiant’s award-winning publishing line. Then, in early 2016, Faith took her long-awaited, much-demanded first step toward solo stardom with FAITH #1 – a groundbreaking debut that quickly became the first and fastest breakout hit of the year from any major comics publisher. In the months since, Faith’s adventures have garnered near-universal critical acclaim and attention from a host of international media outlets, including The Atlantic, Cosmopolitan, The Guardian, The Hollywood Reporter, The Huffington Post, The Independent, MTV, The New York Times, NPR, Nylon, PBS, People, Seventeen, Today, Vox, The Washington Post, and dozens more. Threadless' Hope For The Day Artist Shop can be found at https://hopefortheday.threadless.com/ and, in addition to the newly unveiled Faith design courtesy of Valiant, will also feature new, limited-edition contributions from popular Chicago radio station b96, world-renowned artist Derek Hess, and mental health advocate and illustrator Sow Ay through the month of May.